Deliciously starchy cassava (yuca or manioc) is combined with creamy coconut milk and fragrant mung bean to make this scrumptious Cassava Cake (Banh Khoai Mi Nuong). My recipe makes a simple batter that when baked yields a golden cake that is moist, slightly chewy and just sweet enough. Cut the cake into small pieces and enjoy as finger-food. It makes a perfect little snack or a casual dessert. Enjoy! Use fresh or frozen cassava. 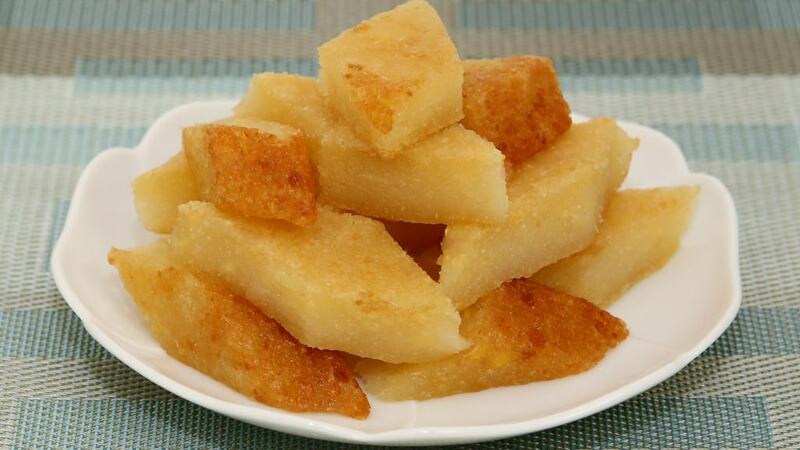 Frozen cassava is really convenient but fresh cassava definitely tastes better. See my video for how to prepare fresh cassava. Be sure to mix the mashed mung well so there aren’t big chunks in the batter. Optionally, use an electric mixer to get the batter smooth. If you’d like a chewier texture, add another 1-2 Tbsp tapioca starch. This cake is medium in sweetness. Adjust the sweetness to your preference. Optionally, use a sugar substitute. If you don’t want to add the mashed mung bean, add more grated cassava to make up the difference. Line the cake pan with parchment paper to make removing the cake a cinch. The cake will deflate when it cools and this is normal. Store any remaining portions in the refrigerator and consume within the week. To reheat, warm the cake in the microwave for 15-20 seconds. You can freeze the cake for up to 3 months when stored in an air-tight container. 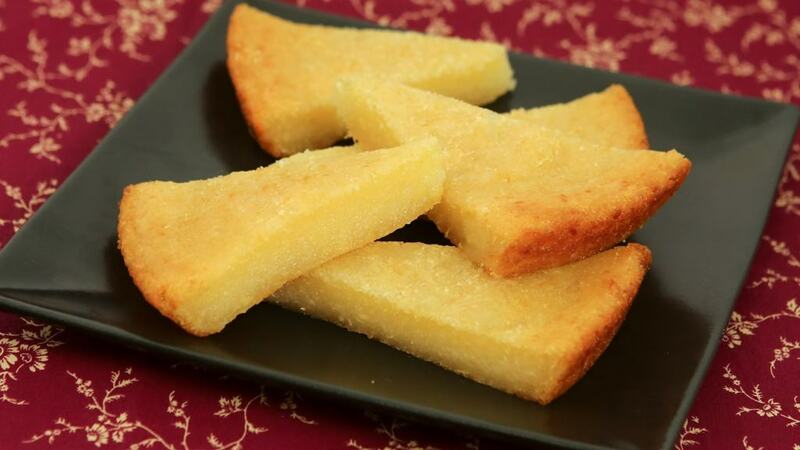 If you enjoy this Cassava Cake (Banh Khoai Mi Nuong) recipe, you may also like: Pumpkin Cassava Cake (Banh Khoai Mi Bi Do), Silkworm Cassava Cake (Banh Tam Khoai Mi), and Steamed Banana Cake (Banh Chuoi Hap). Transfer the thawed cassava into a colander and allow to drain for 15 minutes. In a large bowl, add the drained cassava, mashed mung bean, sugar, tapioca starch, coconut milk and vanilla extract. Mix well making sure the batter is free of lumps. Coat a 9-inch round pan evenly with vegetable oil. Pour the batter into the oiled baking pan. Holding the sides of the pan, jiggle the pan gently and tap on the counter a few times to settle the batter. Check to see if the cake is done by inserting a toothpick. It should come out clean. Brush the top of the cake with melted butter. Bake on 425 degrees Fahrenheit for 5-7 minutes or until the cake is golden on top. Run a spatula around the cake to loosen it from the pan. Remove the cake from the pan using a large spatula. To serve, cut into small wedges or bite-sized pieces. Thanks for all ytour recipes! Do you measure the mung beans presoaked, after soaking, or after cooking because the half cup of mung bean becomes more after I soaked it over night. For this recipe, “mashed mung bean” means it’s already soaked in water, cooked and mashed to yield 1/2 cup mashed mung bean. This is approximately 1/4 cup dry mung bean. Let me know if you have other questions. In the video the cake looks like full of oil when it finished baking. Did you add any extra oil in the cake? Or may the oil from coconut milk? I have to learn well about this recipe before I bake it. Thank you! There isn’t a lot of oil in this cake, just 1/2 tsp. 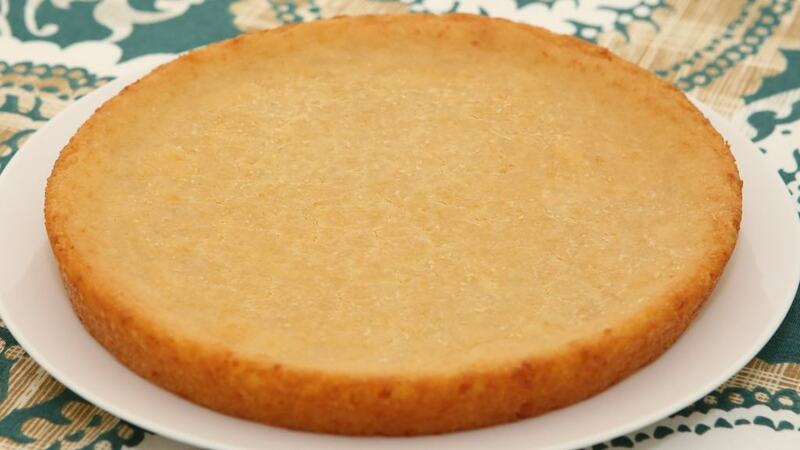 What you’re seeing may be the melted butter brushed on top of the cake to brown up the top. You can omit either of these if you’d like. Good Luck!